i have posted quite a few gujarati cuisine recipes till now in my blog, but personally, i feel handvo recipe is the most healthy recipe. 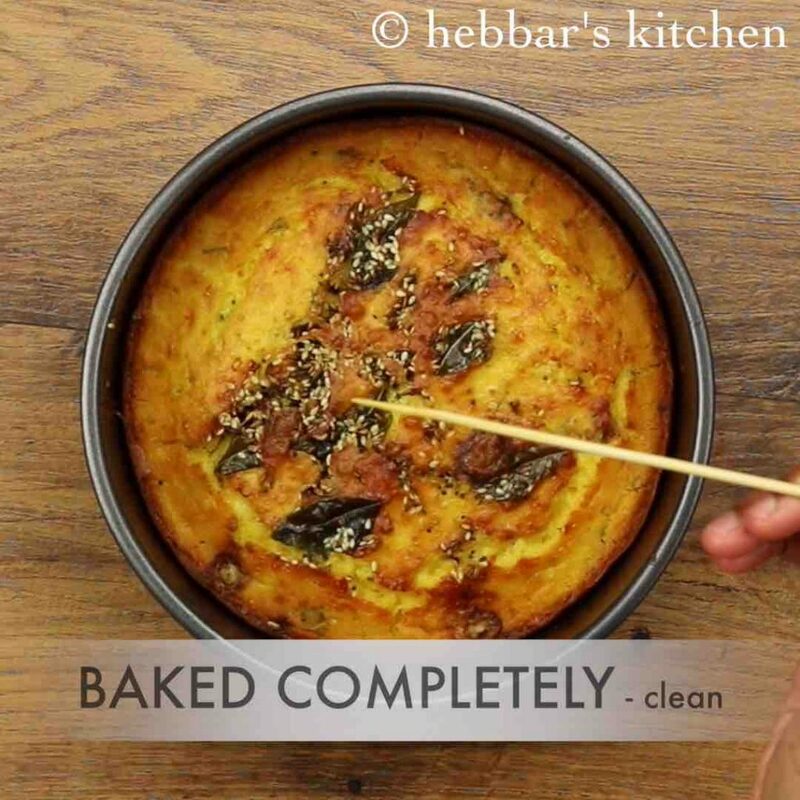 basically, the recipe is full of nutrients particularly a protein-packed filling spicy bread. the texture and appearance is very similar to any popular cake recipe, but has to offer a lot more benefits compared to it. i personally prepare it breakfast and i prepare it well ahead in advance like the previous day. it makes my life easier early morning and i just heat for 1-2 minutes in the microwave before serving. 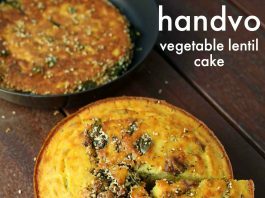 the savory handvo cake can be served as it is, but i personally recommend to serve it with spicy green chutney. 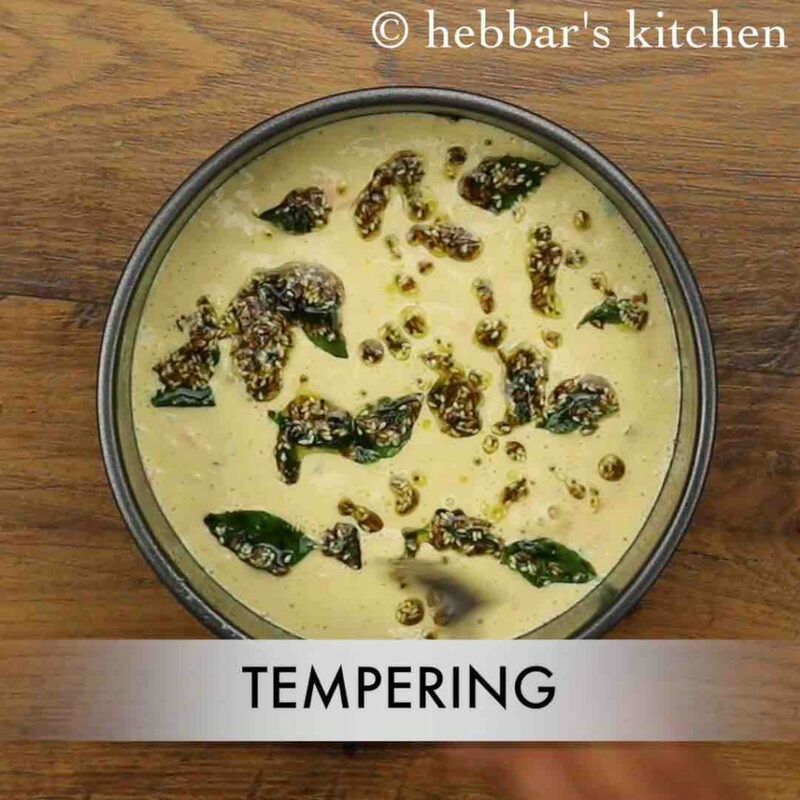 in addition you can also serve it with a combination of green chutney and imli chutney too. the gujarati handvo recipe can be overwhelming especially for the beginners hence, sharing some tips and suggestions for it. 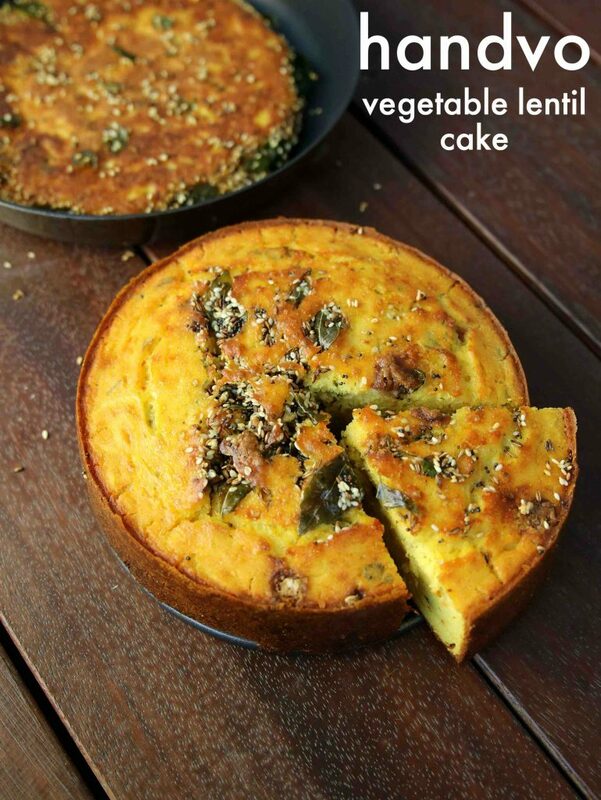 firstly, lauki or bottle gourd is generally added to this vegetable and lentil based cake. but that is optional and can use any choice of veggies like pumpkin, sweet potato etc. secondly, i have used eno fruit salt for hastening the fermentation but as an alternative, you can use baking soda too. 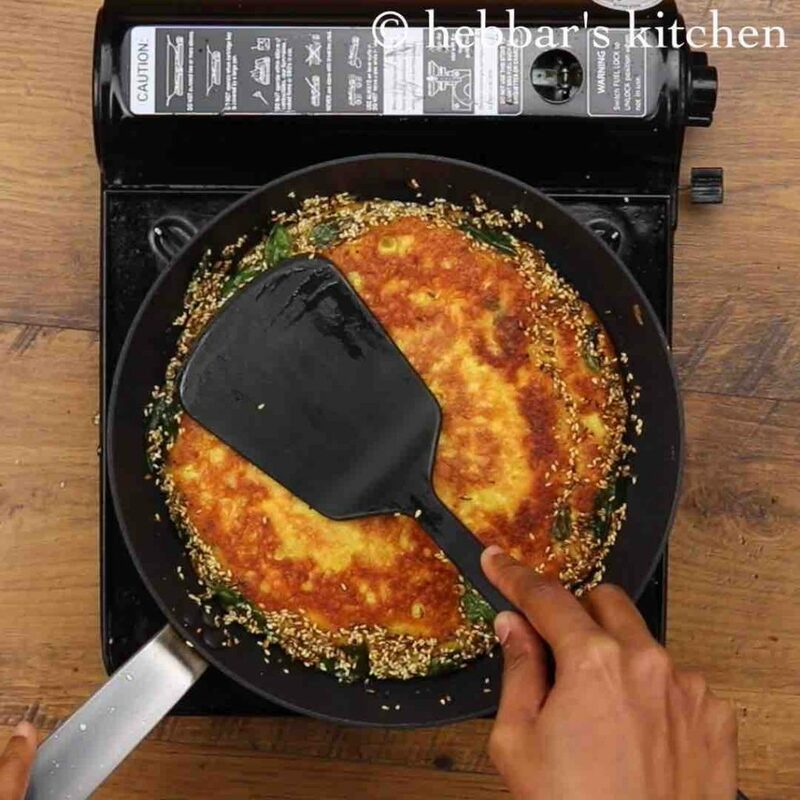 also, ensure to ground the lentil to a thick batter with less water while grounding. 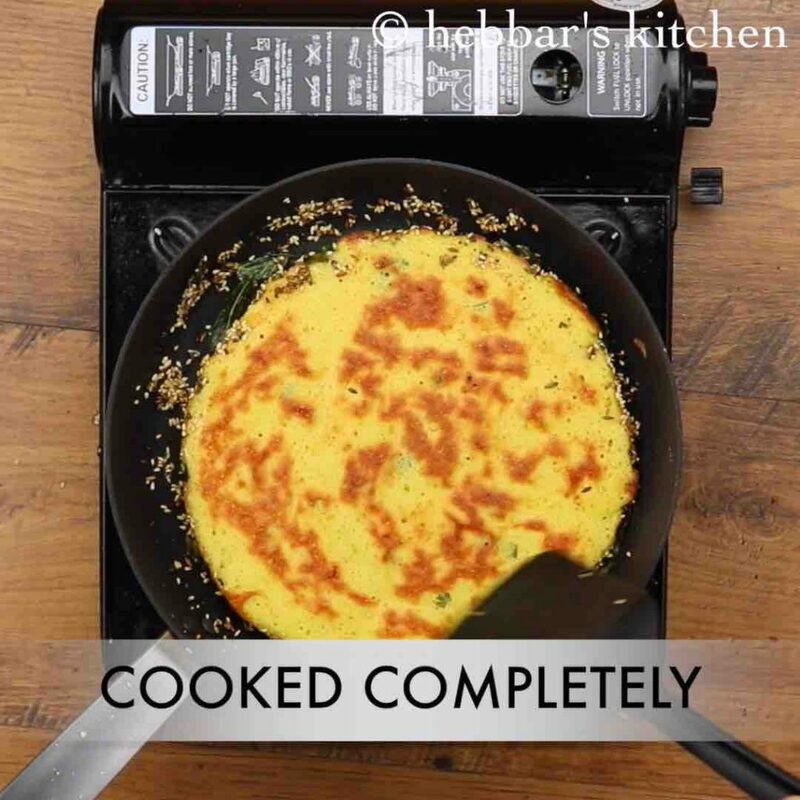 finally, the recipe is generally served for breakfast but can also be easily adapted for evening tea time snacks. serve it with green chutney, tomato ketchup and/or imli chutney. 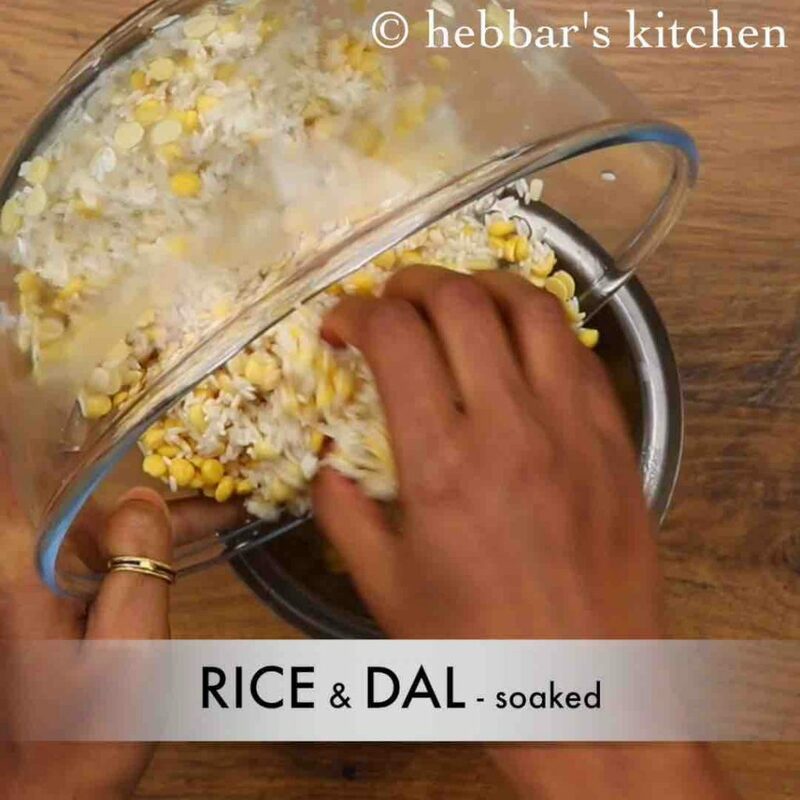 firstly, soak 1 cup rice, ½ cup chana dal, ¼ cup toor dal, 2 tbsp urad dal for 3-4 hours. 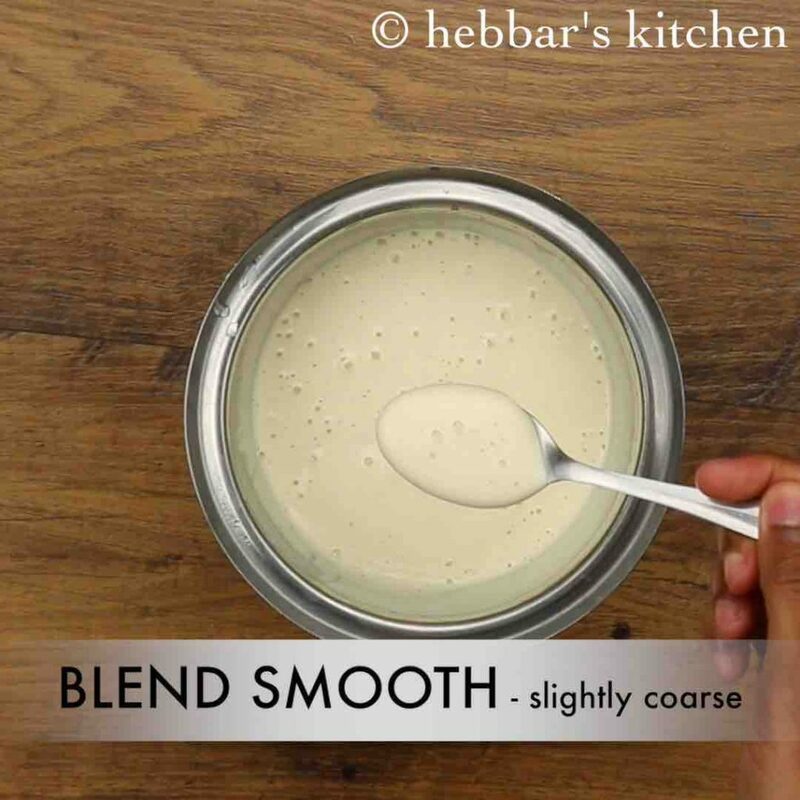 add ½ cup curd and blend to a smooth but slightly coarse paste. 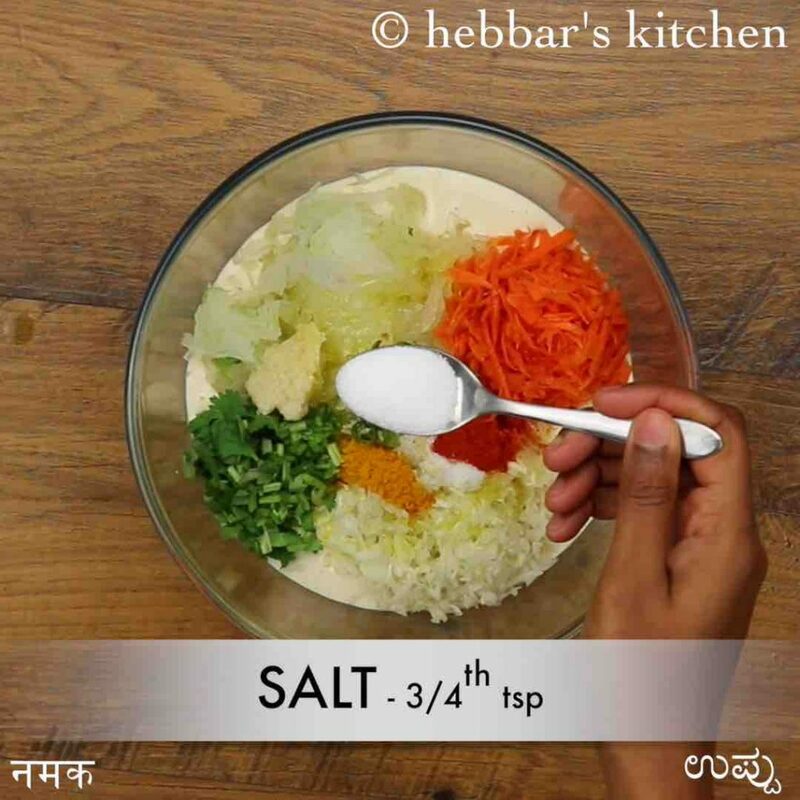 further add 1 cup grated bottle gourd, ½ cup grated cabbage, ¼ cup grated carrot and 3 tbsp coriander. also add ½ tsp ginger paste, 1 green chilli, ½ tsp sugar, ¼ tsp chilli powder, ¼ tsp turmeric, 2 tsp oil and ¾ tsp salt. 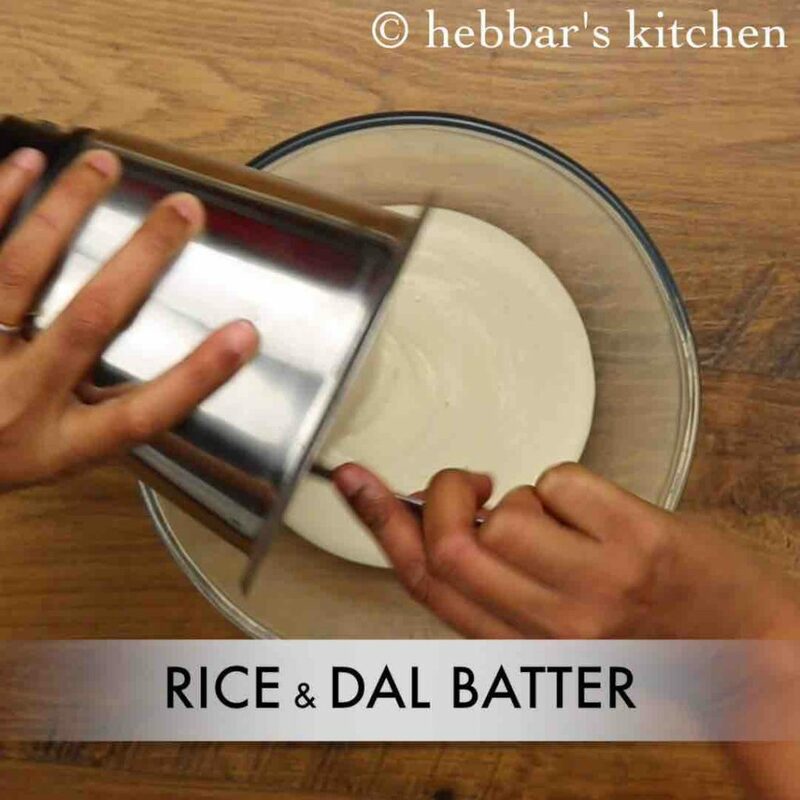 mix well making sure the batter is slightly thick like idli batter consistency. now add 1 tsp eno / fruit salt and mix gently. 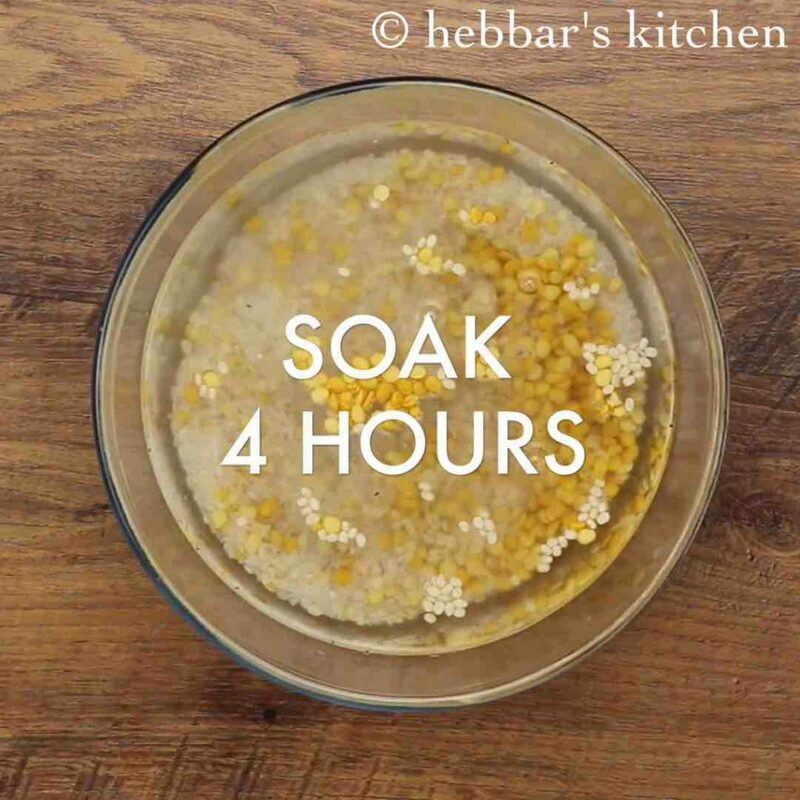 firstly, in a large bowl soak 1 cup rice, ½ cup chana dal, ¼ cup toor dal, 2 tbsp urad dal for 3-4 hours. drain off the water and transfer to a blender. 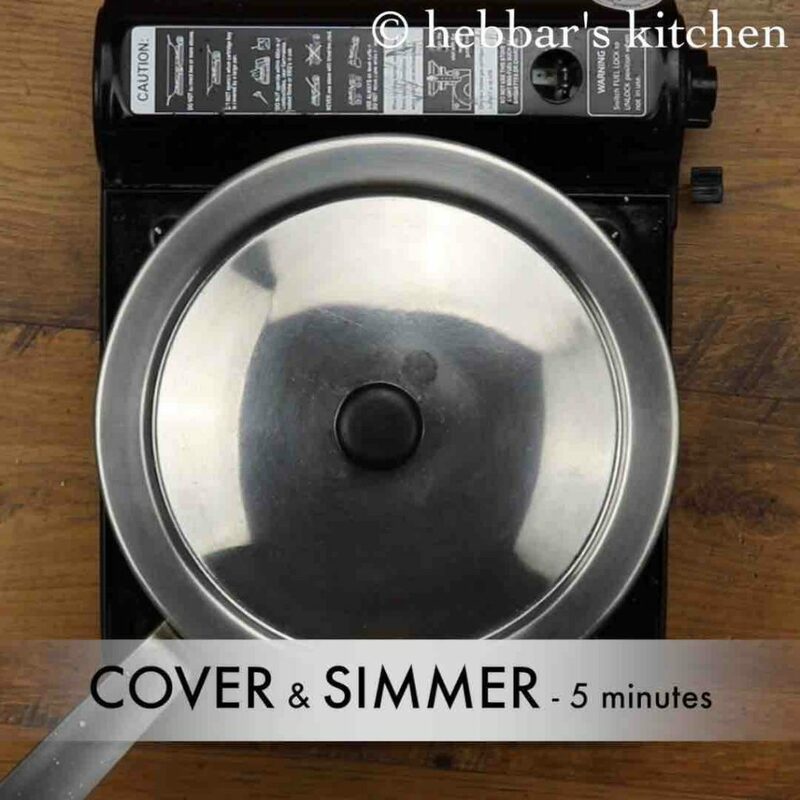 transfer the batter to mixing bowl. cover and allow to ferment overnight if you do not prefer to use eno fruit salt. 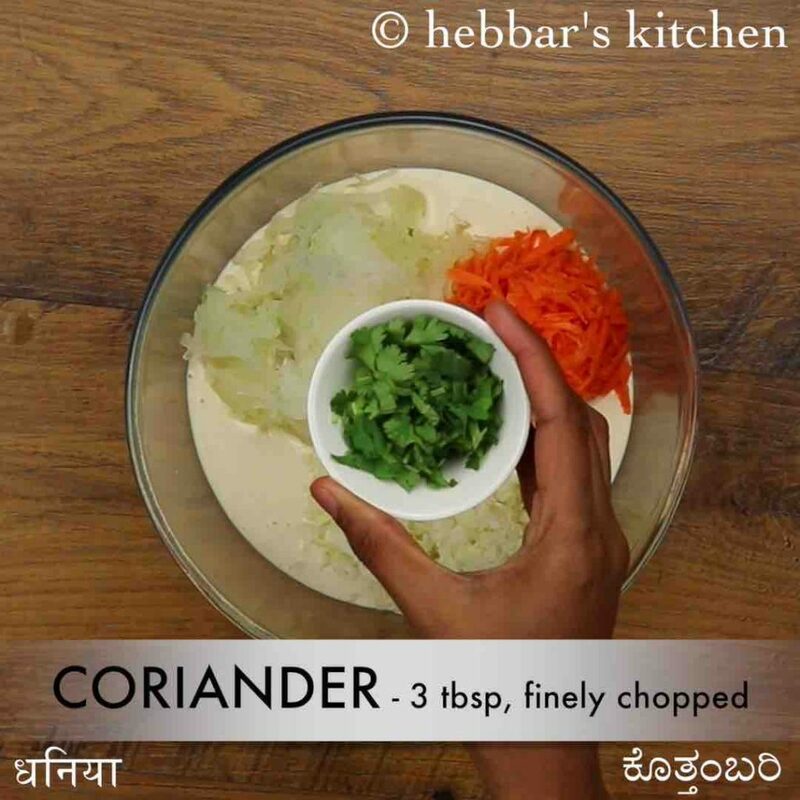 further add 1 cup grated bottle gourd, ½ cup grated cabbage, ¼ cup grated carrot and 3 tbsp coriander. you can add vegetables of your choice. now add 1 tsp eno / fruit salt and mix gently. 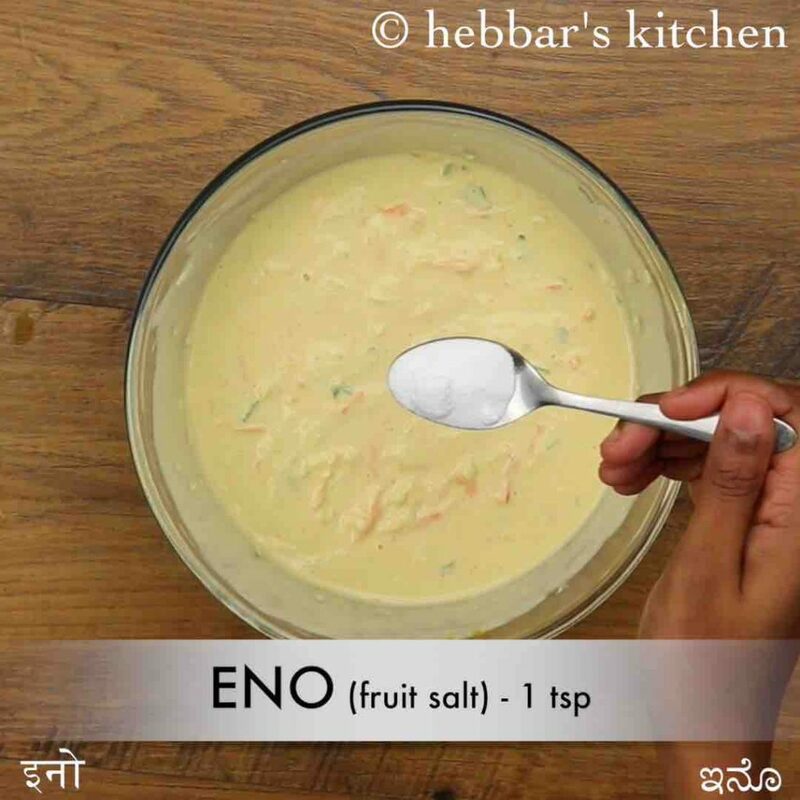 alternatively use ¼ tsp baking soda or ferment overnight if you do not prefer to use eno fruit salt / soda. 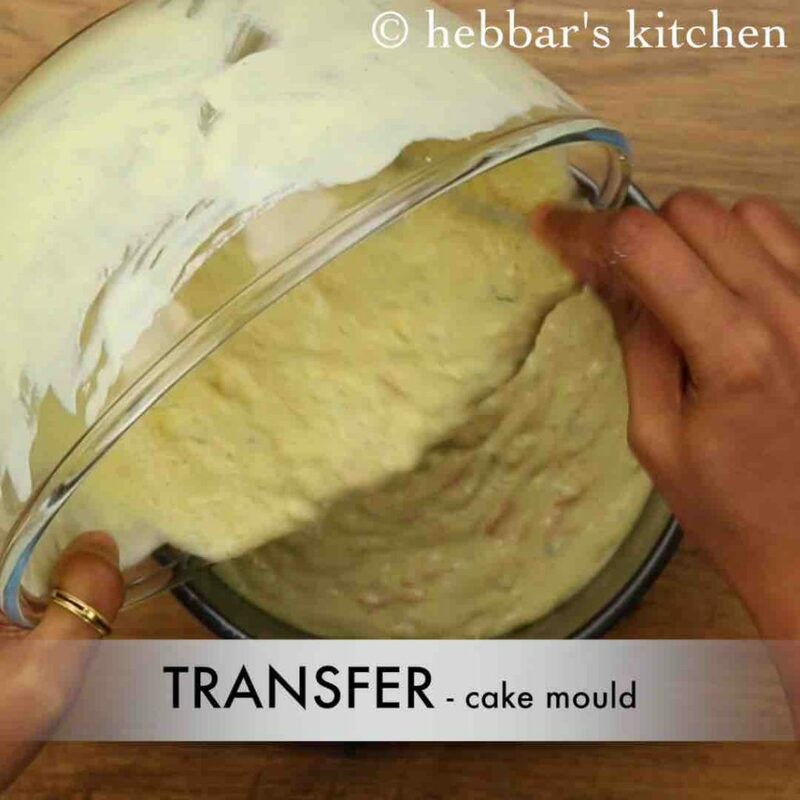 transfer the batter into the round cake mould (dia: 7 inch, height: 4 inch). make sure to grease the mould with oil to avoid sticking and line butter paper at bottom of the tray. 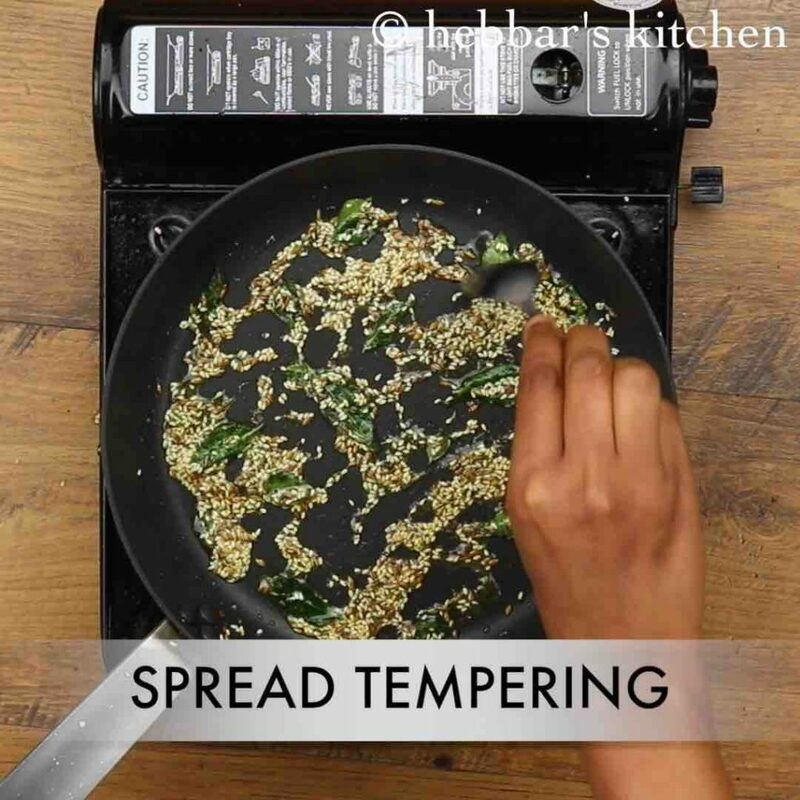 now prepare the tempering by heating 3 tsp oil. 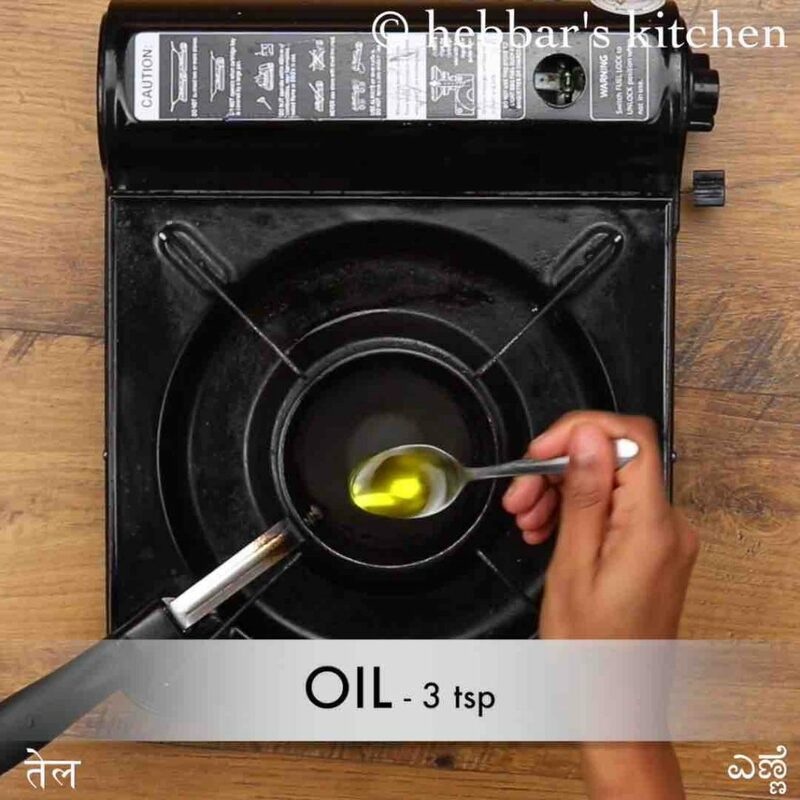 once the oil is hot add ¾ tsp mustard, ½ tsp cumin, 1 tsp sesame, few curry leaves and pinch hing. allow to splutter and pour the tempering over handvo batter. 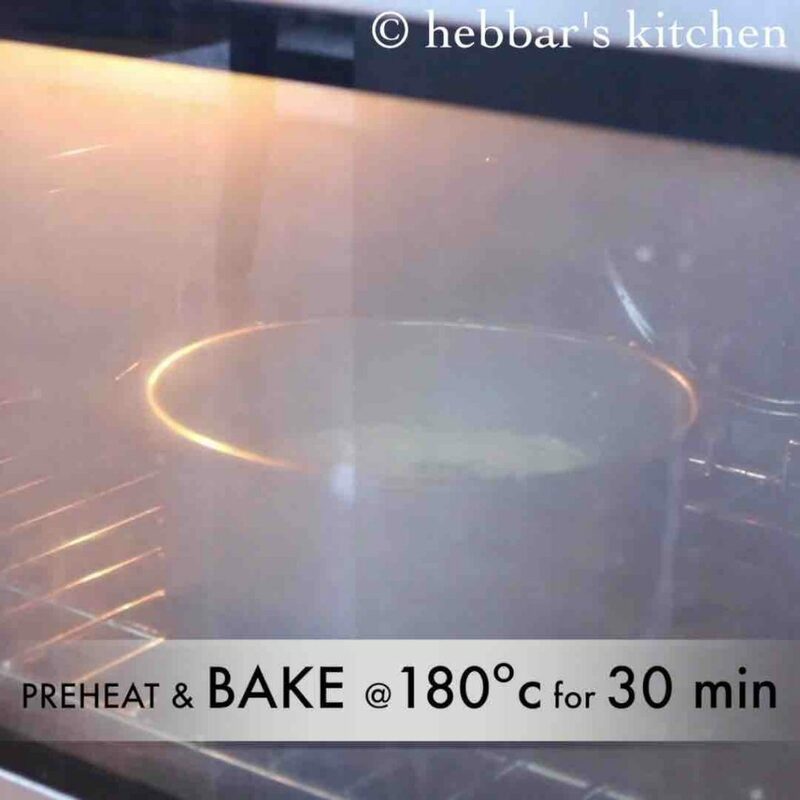 place the handvo tin into the preheated oven and bake at 180 degree celsius for 30 minutes. bake till the toothpick inserted comes out clean and crisp top layer is formed. 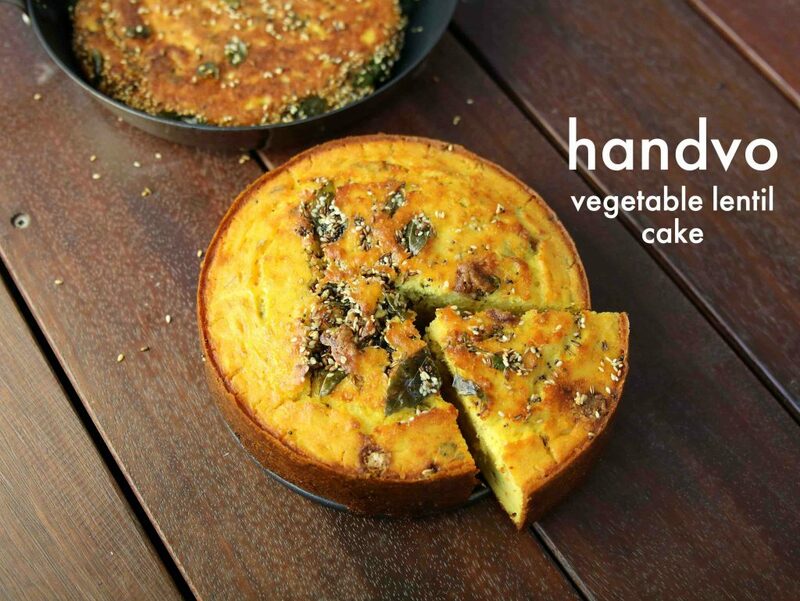 finally, serve gujarati handvo / vegetable lentil cake with green chutney. 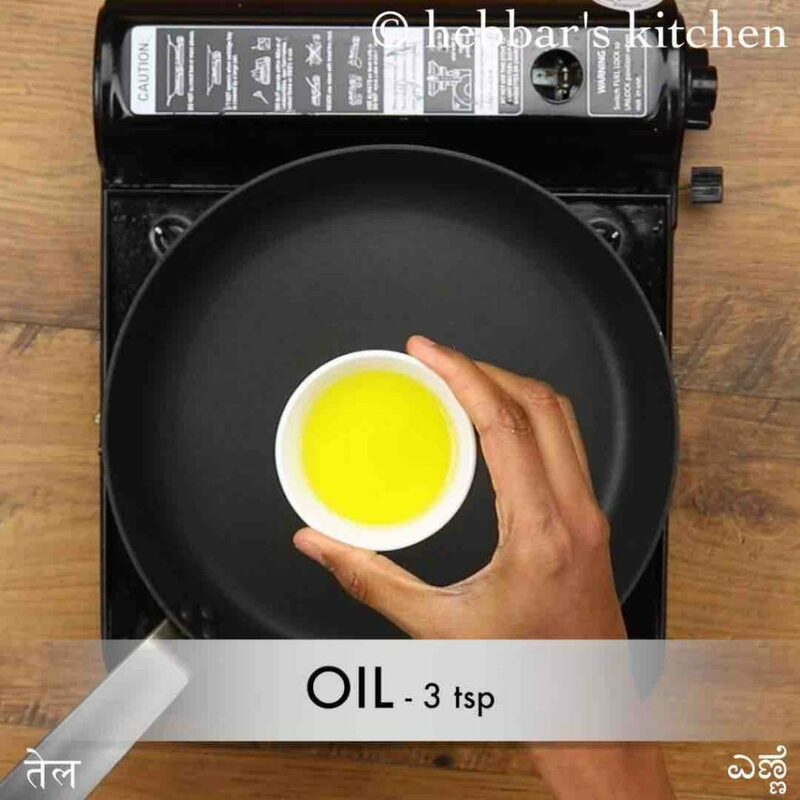 firstly, heat a pan with 3 tsp oil. 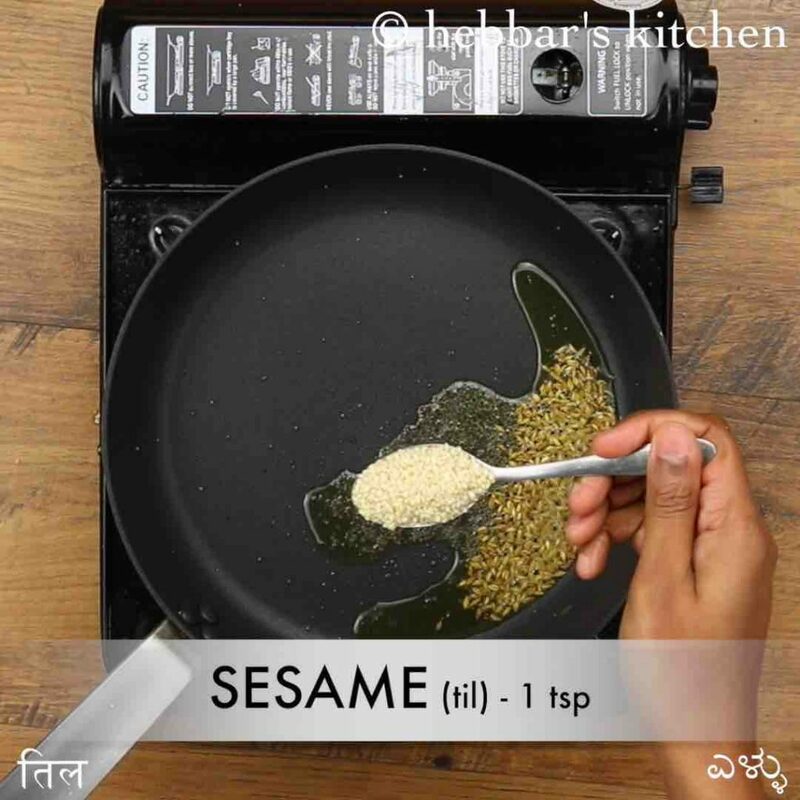 once the oil is hot add ½ tsp mustard, ½ tsp cumin, 1 tsp sesame, few curry leaves and pinch hing. saute and splutter the tempering. also spread the tempering uniformly over tawa. 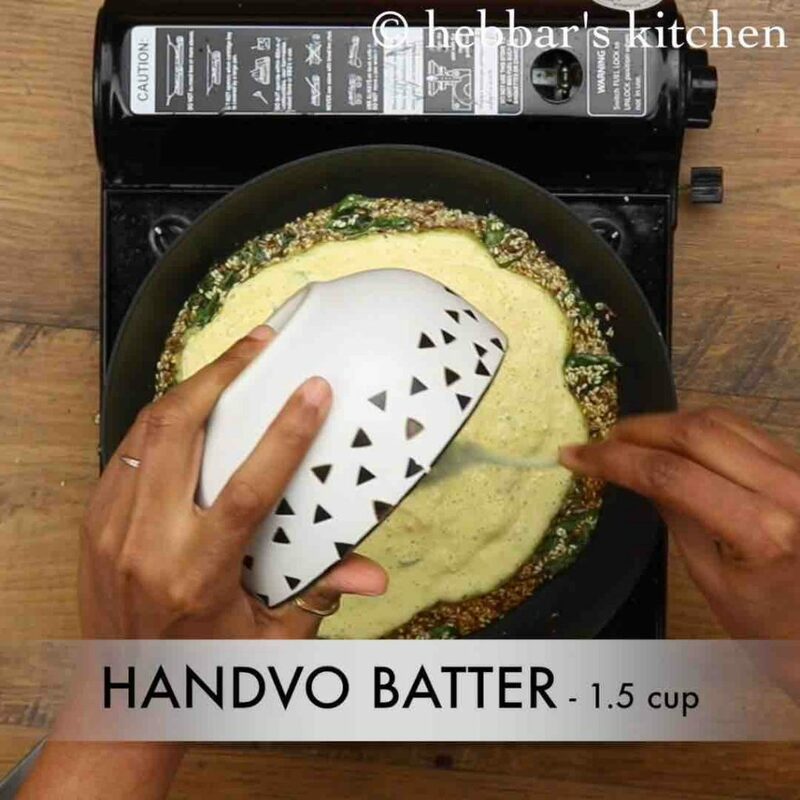 pour 1½ cup of handvo batter spreading uniformly. cover and simmer for 5 minutes or till the top layer are dried. flip over gently making sure the bottom layer has turned crisp. cover and simmer for another 5 minutes or till the handvo are cooked completely. 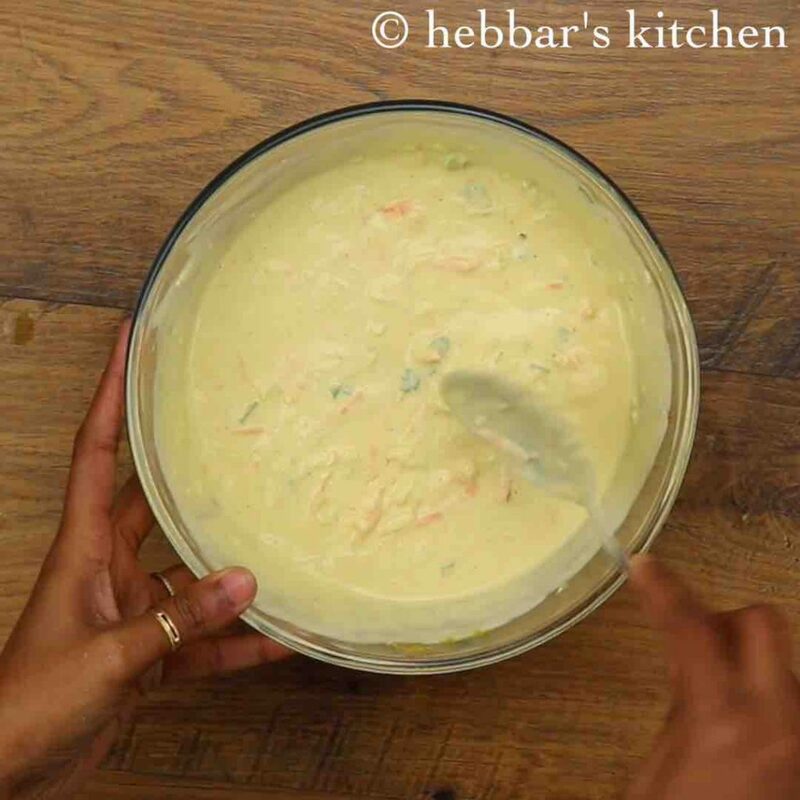 firstly, prepare thick batter as the batter turns watery when vegetables are added. 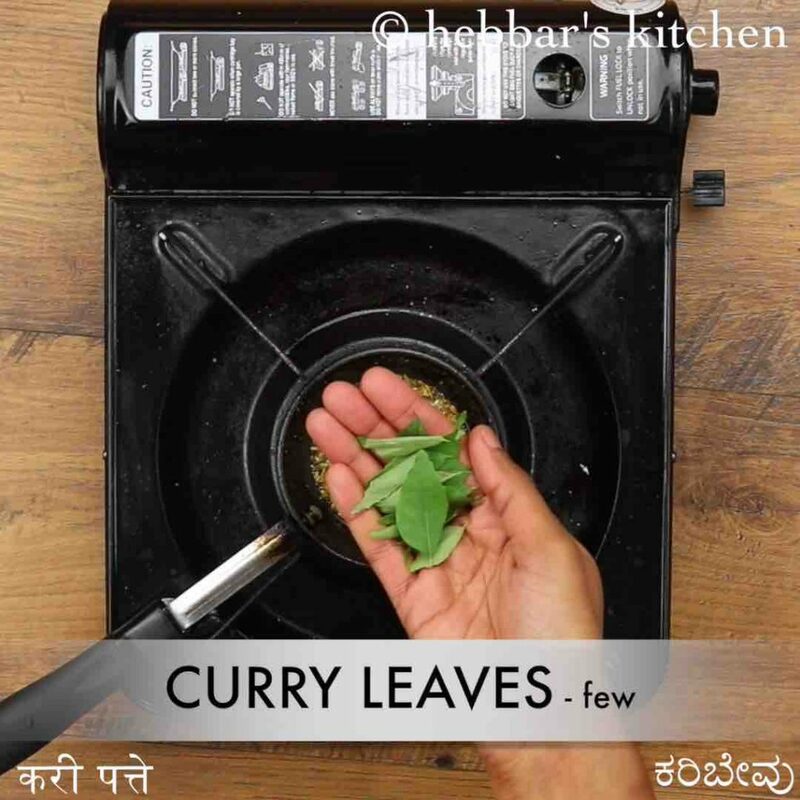 also, add fenugreek leaves more rich flavour in handvo. additionally, ferment the batter overnight after grinding to avoid adding eno / baking soda. furthermore, add eno / baking soda just before baking. else the handvo will not be spongy. finally, prepare slightly thin gujarati handvo when preparing on tawa as compared to baking in the oven.